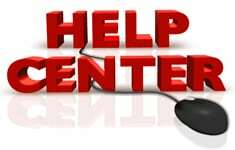 If you are thinking about installing a CB radio in your Jeep, you are not alone. 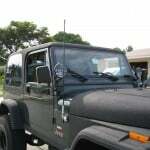 Thousands of Jeep owners have a CB radio and antenna mounted on their rig. Having a CB radio provides a mode of communication for chatting with friends on the trail, and a safety feature for contacting help when needed. 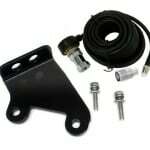 The antenna is the most important component of your CB radio system. Where you mount the antenna is as important as which antenna you choose. 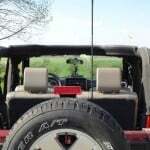 There are several options for mounting locations for your Jeep CB antenna . We will outline some of the more common ones here. 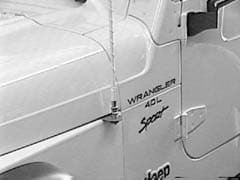 Hood mounts, or fender mounts, are a popular option for mounting an antenna on a jeep. This is in part because it makes routing the cable easier. 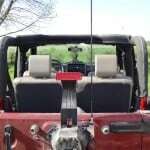 It is also an easy mount to attach if there is a mount specific to your year and model of Jeep. When there is, you simply use existing bolts on the fender to attach the mount. 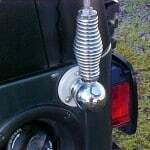 If there isn't a specific mount for your Jeep, you can still use a universal Jeep fender mount. You will just have to drill holes. It is best to use an antenna that extends at least one foot above the roof when installed on the fender. Using a shorter antenna can cause a higher SWR. Your transmit signal will be weaker to the front driver’s side of the vehicle, where there is no ground plane. The coax for the antenna will have to be routed under the hood at or very near the mount location. It is usually routed through the firewall under the hood from there. When installing an antenna on the hood, you will typically end up with some slack in the coax. It is better to run it in a figure 8 and stow it somewhere rather than shorten the coax. 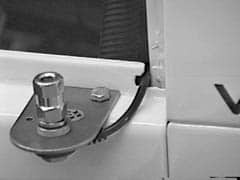 It may be necessary to brace the antenna or otherwise protect the vehicle from being struck by the antenna when mounted in this location. When doing this, take care not to ground the antenna and tune the antenna after adding anything. The powder coating on Teraflex tail light mounts may need to be scrapped off to make good contact for a ground. AU mounts do not have this issue. 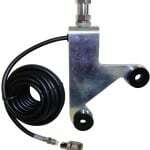 It is best to use an antenna that extends at least one foot above the roof when installed on the tire rack. Using a shorter antenna can cause a higher SWR. Make sure your tire rack has a good electrical ground for the antenna mount. If it doesn't, you may need to run a ground wire to the mount. 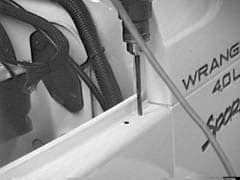 It is best to use an antenna that extends at least one foot above the roof when installed on the bumper. Using a shorter antenna can cause a higher SWR. 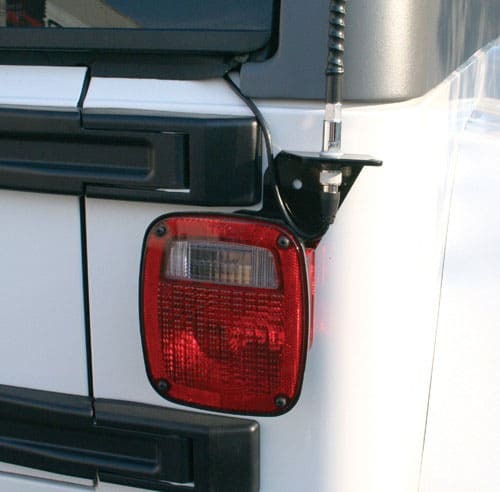 Make sure your bumper has a good electrical ground for the antenna mount. If it doesn't, you may need to run a ground wire to the mount. Ball mounts and side mounts may require you to have access to both sides of the mounting surface. It is best to use an antenna that extends at least one foot above the roof . Using a shorter antenna can cause a higher SWR. Make sure your install location has a good electrical ground for the antenna mount. If it doesn't, you may need to run a ground wire to the mount. Generally speaking, the taller your antenna, the better range you will get. Having said that, you need to keep it practical. While an 8.5' whip will get you far better rang than a 3 foot fiberglass antenna, it will also whip around a lot on trails, catch more tree branches, and smack overpasses, drive through overhangs, and garage doors. 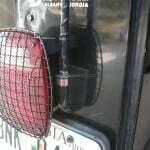 We find a 4' fiberglass antenna on a taillight or spare tire mount works very well. You can drop the mount down lower (like to the bumper), but you will want to increase the antenna length. 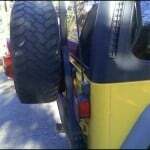 You need the top 1' - 2' above the roof line of your Jeep. Some events ban whip antennas to prevent injuries. Consider a quick disconnect or tie down for taller antennas if you will be going into low clearance areas like forests or garages often. Tune your antenna after installing it! Bone up on your CB radio lingo before you go on the air! Cobra 75 WX ST - This radio is an all-in-the-handset unit; entire radio is contained in a handset that is a little bigger than the average radio's microphone. This makes the radio very small, lightweight, and easy to work. These radios take up very little space in your ride, leaving plenty of leg room to bounce around. Uniden PRO520XL - This is the smallest mobile CB radio available. It is small enough to mount in your dash. It has a minimum set of features, but still comes with RF Gain (probably the most important feature a radio can have) and PA out. Uniden BC880 - This is a slightly larger radio that has a fuller feature set and a modern, all digital interface. The features include a built in SWR meter for tuning your antenna, weather channels, and a color changing display. Cobra 18 WX ST II - This radio can be installed in the dash like the PRO520XL. It features weather channels, a front-facing speaker, and a channel scan. The front speaker eliminates the need for an external speaker when dash mounting.